To celebrate the release of Assassin’s Creed in cinemas we’ve got 3 sets of amazing official Assassin’s Creed merchandise to giveaway! Through a revolutionary technology that unlocks his genetic memories, Callum Lynch (Michael Fassbender) experiences the adventures of his ancestor, Aguilar, in 15th Century Spain. 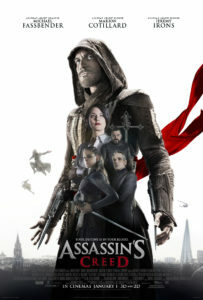 Callum discovers he is descended from a mysterious secret society, the Assassins, and amasses incredible knowledge and skills to take on the oppressive and powerful Templar organization in the present day. ASSASSIN’S CREED stars Academy Award® nominee Michael Fassbender (X-Men: Days of Future Past, 12 Years a Slave) and Academy Award winner Marion Cotillard (The Dark Knight Rises, La Vie en Rose). The competition ends at 23:59 on 15 January 2017.
a keychain, a cap, an A5 notebook, a T-Shirt and a tankard.